The Paramus Public Schools curriculum adheres to New Jersey state standards in all subjects, including the core areas of language arts, mathematics, science, and social studies. We also offer instruction in art, music, and physical education. For more information about state standards and assessments, please follow the links on this page. We are committed to the academic achievement of our students. In each subject, our curriculum addresses the academic, social, and emotional needs of the whole child. We invite you to review our curriculum by subject using the link below. 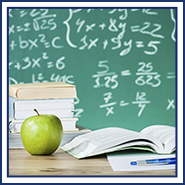 Learn more about New Jersey’s educational standards and assessments.